I haven't bought a single Amiibo yet, but maybe that's because Nintendo hasn't made one I'm looking for yet. 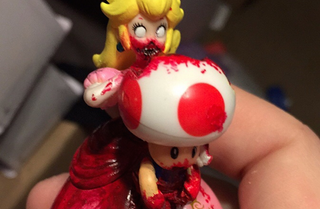 Reddit user darkdreamr has spent some time modifying their Princess Peach Amiibo and came up with a potential line of NFC-enabled figures I can get behind: zombiibos. There's even more detail on the backside of the custom Amiibo. "In the back of her head there's an exposed brain hole and a nice stream of blood soaking the back," they wrote. "But I'm not good at remodeling hair- so I consider her more of a 'fresh' zombie lol"
Mmm, brains. I'd pay good money for one of these!